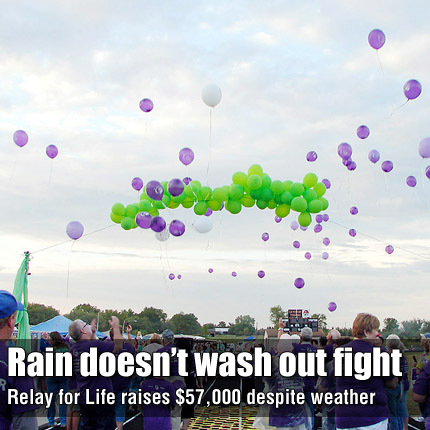 Spirits were not dampened Saturday night, as the rain delayed the opening ceremony of the 13th annual Relay For Life of Osage County. Once the rain cloud passed, participants began their evening journey by “Walking the Yellow Brick Road to a Cure”. Opening ceremony kicked off with the raising of the flag by the Boy Scout Troop 106 and the national anthem sang by Jim Gardner. Event chair Julie Trout and co-chair Angie Gardener welcomed the crowd to the overnight event that raised over $57,000 for the fight against cancer. Cancer survivors were honored during their victory lap and team captains were introduced for a team strut. The luminaria ceremony, presented by Janene Fry, included lighting the luminary bags in honor of those fighting cancer and in memory of those that have lost the battle to cancer. Jim Gardner and Jenny Long presented Reading of the Names. A slide show was made available with photographs submitted by Relay participants. Ending the ceremony was a tiki-torch lap, led by families and friends remembering loved ones lost to cancer in the past year. Awards for the night included the most creative campsite, given to the teams Do It For Dena, Melvern Flamingo Walkers and Mission Possible. Top fundraising individuals included Philip Wiederholt with $2,884 raised, Rick Garvin with $2,847, Kathy Isaacs, $1,290, and Delmer Haufler, $1,050. Top fundraising teams included RJ’s Auction Service, $10,221.50, Melvern Flamingo Walkers, $5,387, All in the Family, $5,123, Lyndon State Bank, $3750 and Zion Lutheran Church $3582.69. The most popular entertainment was the crowning of Queen of Relay. Seven male participants, dressed as ladies, collected donations to determine the winner. The winning competitor was Kevin Fry with $83 in votes, which helped raise a total of $300 towards the event. The Relay ended with a prize drawing for those who had stayed the entire night, and awards were given to teams for their fundraising achievements. Fun and games continued throughout the night with music from J&L DJ Services. The Relay committee and team captains will attend a wrap-up meeting 6:30 p.m. Sept. 20 at the Sunflower Ballroom, in Burlingame, to discuss the success of the event. The meeting will include a light supper. For more information, contact Julie Trout (785) 608-8732.